Take action now! Make a difference! Help save the basic income pilot project! We have to stand up for all Ontarians and save the basic income pilot project. When governments break the law, the courts are there for the people to seek justice. 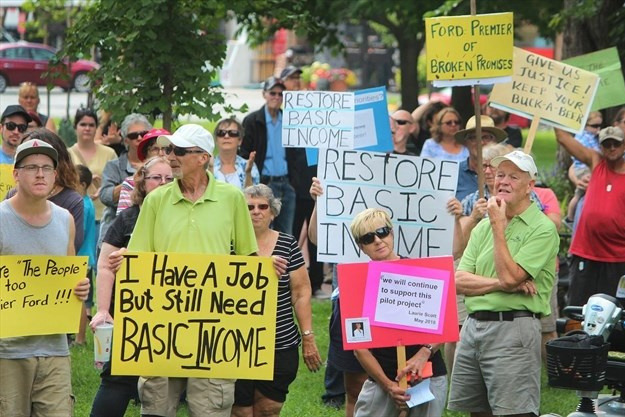 A class action lawsuit has been filed to help the participants hurt by the decision and to overturn the government's decision to cancel the basic income pilot project. Your donations will help save the basic income pilot project. The case is being brought pro bono, so all proceeds will pay for court fees and filings, administrative support and legal research, office supplies, mileage, and costs incurred related to the lawsuit. Stand up! Be Part of the Action! We're all in this together! As we head into court Monday morning, we want to be sure to let you how much your spirit and generosity have meant to this cause. While there have been no lawyer fees, your financial contributions have helped pay for the legal expenses of bringing this case, including court filing fees; office supplies, photocopies, printing, etc. ; transcripts of cross-examinations; and administrative support, expert fees and insurance. Again, your support has been very encouraging. Challenging in court the government's decision to cancel the basic income simply would not have been possible without your stepping up. Thank you to all of our donors for all of your support and kind words. We truly appreciate all of you. Our case coordinator Danielle will be managing all of the funds donated to Save the Basic Income Case. This responsibility includes withdraws, paying for all expenses related to the case and keeping a detailed expense list. Please continue to spread the word and help us save the Basic Income Project Pilot!